A courtesy image of the news team at Bangor TV stations WVII and WFVX, including Tony Consiglio and Cindy Michaels (center), as well as Lindsey Mills (third from right) and Jared Pliner (second from right). 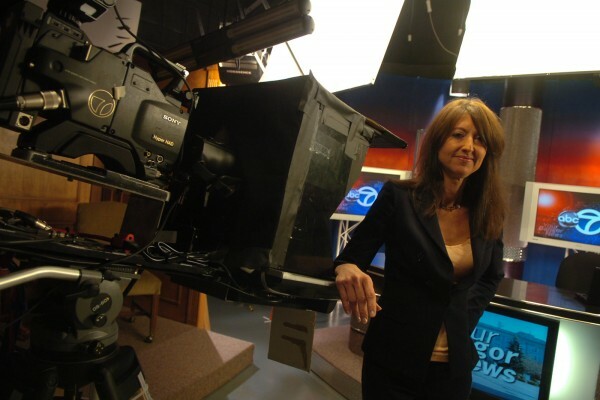 Cindy Michaels, then-news director of WVII-TV, stands in the ABC/Fox television station in Bangor in July 2011. BANGOR, Maine — The management of Bangor’s ABC and Fox affiliates will continue the expansion of the TV stations that began last year even as it seeks to replace the two reporters who resigned on-air earlier this week. “I plan on hiring someone within a week from today. I have already reached out to one person and will be having dinner with them this weekend,” Mike Palmer, general manager and vice president of WVII-TV, Channel 7, and WFVX-TV, Channel 22, said Friday. In 2011, the stations began investing in new equipment, adding staff and expanding news programming to include a new studio set, high-definition technology and two morning news shows. News director Cindy Michaels and executive producer Tony Consiglio resigned at the end of the 6 p.m. newscast they anchored Tuesday. Palmer said that with the hiring of replacement employees, he’s looking to continue the renovation and expansion of the news stations that began early last year. He said both new hires should be in place by early 2013. “We want someone who is a happy warrior, who is dynamic and can find the news and break news,” said Palmer, who has been general manager for 10 of his 13 years at WVII. Palmer said he’ll have a news director named by the end of the year. Unlike Michaels and Consiglio, the new anchors will not also hold the titles of news director or executive producer. “We think it’s too much for one person, to anchor the news and also be a director. It’s two jobs,” Palmer said. At least for now, Lindsey Mills and Jared Pliner, who started anchoring a new 10 p.m. Sunday newscast in September, will co-anchor the stations’ 6 and 11 p.m. newscasts starting Monday. The 10 p.m. Sunday newscast will expand to Saturday once ABC’s regular college football season concludes. Meanwhile, Michaels and Consiglio were interviewed for a coming story in The New York Times, and Michaels is having a business article she wrote about Yarmouth-based Cuddledown home furnishings business published in Downeast magazine. The circumstances surrounding their surprising exit from WVII continue to fuel discussion, and some have disputed their stated reasons for leaving. Palmer said that not only does upper management not interfere with news, Michaels and Consiglio are not being truthful about their reasons for leaving. Palmer and a few station employees have said the main reason for their resignations was the impending departure of Consiglio, who, according to Palmer, was going to be let go next week. “I can tell you on the record that he was going to be let go, Cindy knew about it, and she could not go on without him,” Palmer said. Yet when asked a moment later if she knew Consiglio was going to be let go, she had a different response. “I don’t want to answer that,” Michaels said. She also was asked about statements by Palmer and other station employees that she was offered a contract extension with the provision that she would not retain her news director title. “I know they wanted to move me to the 10 and 11 newscasts to anchor, but I wasn’t even under contract,” she said. Peter Farrar, a master control operator for the stations, said he was one of nearly a dozen employees who met with Michaels and Consiglio after their resignations. Farrar said Michaels recruited him to become WVII’s assignment editor, but he left that job after a month. WVII has historically ranked third among Bangor’s three main TV news outlets. WFVX became a Fox sister station affiliate in 2003. In the most recent Nielsen ratings for the Bangor Designated Marketing Area taken last July, WABI-TV, Channel 5, ranked first in average viewers, ages 18 and older, for 6 p.m. Monday-Friday with 36,000. WLBZ-TV had 20,000, and WVII-TV had 2,000. In average number of adult viewers (ages 25-54) from 6 to 7 p.m. Monday-Friday, WABI ranked first at 10,500; WLBZ at 6,300; and WVII at 500. Still, the mood at WVII-WFVX seems to be on the upswing, according to a few current employees. “Let’s put it this way, the newsroom has been a much happier place the last three days,” Farrar said Friday afternoon.